Dobyns Rods Cranks It Up with a Search For One Candidate! Total Score: 8.00 - EDITOR'S CHOICE! 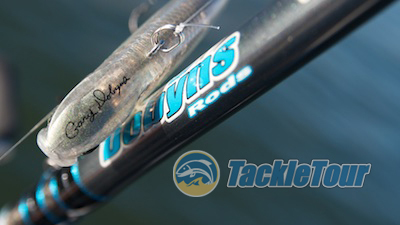 Introduction: It's been five short years since we've taken a look at a Dobyns Rods cranking stick. Five long years, since Zander made away with my 704CB Glass. So when I recently heard about a new stick in this sub-lineup within the Champion series, a 7'6" medium heavy powered graphite cranking rod, I was intrigued. Dobyns has had a glass rod with these same specifications in the lineup for some time now, but to make one in graphite suggests the stick will have greater versatility than just a cranking stick. Time to take a look. 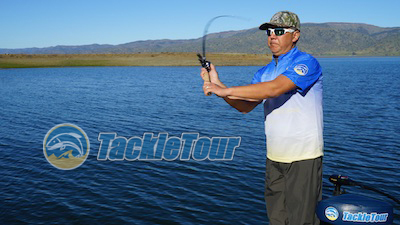 Here is our review of Dobyns Rods' Champion Series 765CB. Quality/Construction: The 765CB is a one piece, seven foot, six inch (7'6"), stick featuring the typical painted matt black finish found on all Dobyns Rods Champion series sticks. The grip is made of good grade cork with visible changes in grain between the rings and a fair amount of filler. There are no gaps between materials as the grip changes from compressed cork, to aluminum accent rings to cork, etc.. Introducing Dobyns Rods's 765CB Graphite Cranking Rod. Epoxy work is very clean and the thread wraps are tight with no visible gaps. Looking down the length of the rod from reel seat towards the tip, both the blank and guides are in perfect alignment. Our review specimen is a very clean build. Performance: I fished this rod with a variety of reels including a Quantum Tour Mg and a Shimano Aldebaran. Our on the water tests were all conducted in Northern California at Clear Lake, The California Delta, and Lake Berryessa. Time for some tests out on Lake Berryessa, CA. 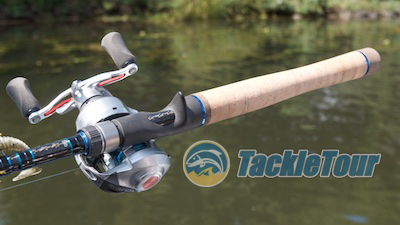 Casting: This is a really fun rod with which to cast and pitch. It loads very smoothly and is effortless during release to the point it doesn't feel like a seven foot, six inch rod - it feels more like a seven footer. Yet when you lay into it for distance, it certainly delivers. Its recommended lure range of one quarter ounce to one ounce feels just about right as well. The 765CB comes with a Fuji ECS reel seat. 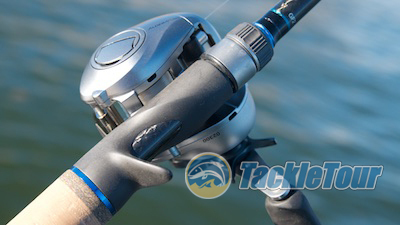 Sensitivity: The added benefit of fishing a graphite rod for cranks versus glass is always going to be sensitivity, but even then some graphite cranking sticks are made from such low grade graphite that they feel dead in your hands. This is not the case with the 765CB. It's very lively and really, if it didn't have a "CB" at the end of its designation, I wouldn't even think of this rod as a cranking stick. 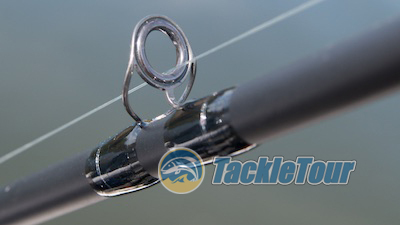 I feel equally confident and comfortable using this rod for Senkos and other soft plastics Texas rigged or otherwise. Kigan's new tangle free, SS framed SiC guides. Next Section: Power to Crank!